Bioversity International is a global research-for-development organization with a vision – that agricultural biodiversity nourishes people and sustains the planet. 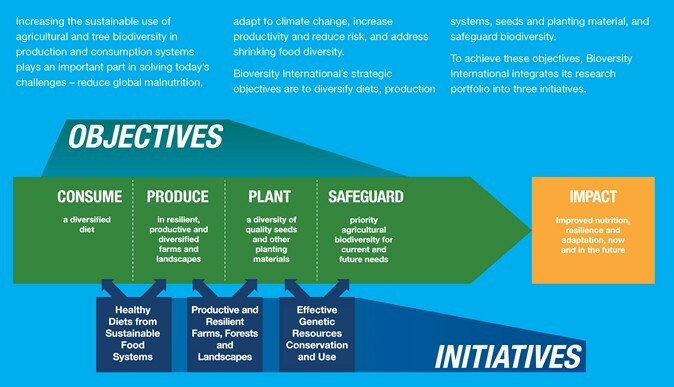 Bioversity International delivers scientific evidence, management practices and policy options to use and safeguard agricultural and tree biodiversity to attain sustainable global food and nutrition security. Bioverity International works with partners in low-income countries in different regions where agricultural and tree biodiversity can contribute to improved nutrition, resilience, productivity and climate change adaptation. Research at the Montpellier office is particularly focused on the conservation, production and commercialization of bananas and other plants like cocoa and coconut, as well as agricultural ecosystems. Numerous interactions and collaborations exist between Bioversity International and Agropolis International member institutes and notably with CIRAD. Bioversity International is one of 15 CGIAR System Organization Research Centres. CGIAR System Organization is a global research partnership for a food-secure future. Bioversity International has more than 300 scientists and staff working with partners in more than 90 countries in the developing world. Our headquarters are based in Rome, Italy and we have offices in the Americas, Africa, Asia and Europe.